Huge area waterfront to hills! Rainbow Realty entered into a contract a few months ago with CODEVI(the agency in charge of titles in Villa Borinquen). For ALL of our clients, this is an opportunity to work with us as your Broker, to negotiate a title into your hands. This is for those who are already in CIVIL POSSESSION(without title) AND also, for ANY CURRENT BUYER interested in PURCHASING (UNtitled/UNregistered as we call it)NOW along with buying the Possessionary Rights(Civil Possession)of the person currently holding those for a lot that they want to transfer; we can arrange a deal on title AND CLOSE AT THE SAME TIME!! THIS applies to vacant land lots and also to those lots that have a house ! 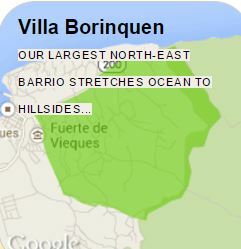 You can refer to our sales pages and click Villa Borinquen. Titled is already titled, but the others that say Unregistered Title, are the ones this opportunity refers to. BUYERS who have already purchased thru us, we can now represent you in the tilting process…AND NEGOTIATE for you!!!! Buyer (or seller of rights) MUST pay for an appraisal ($500.00). If Buyer pays, CODEVI will credit that amount to the sales price at closing! Buyer pays closing costs, but i believe all is somewhat negotiable! If Sellers want to get a jump on this process, getting the appraisal done will help in attracting a BUYER! The estimate of appraisal is $19-23/sq mt i was told; to determine land value…and CODEVI seems highly negotiable at this point. We are pleased that CODEVI wants to work with US…so we can offer our clients this service. Please let us know , if you want to pursue EITHER of these avenues to acquiring title in VB.